The new reinforced resin or bonded all-porcelain type of cap has the nicest appearance. This cap can be made from pure ceramic or a new reinforced composite resin. It is almost indistinguishable from natural teeth. The new bonding technology involved provides an exceptional bond your tooth. It is metal-free, and thus satisfies the needs of patients with metal sensitivities. 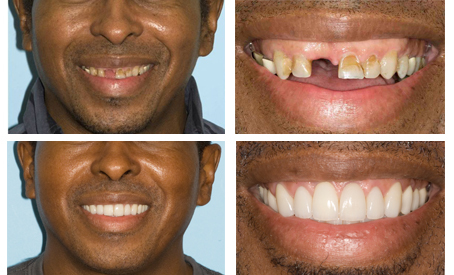 This type of procedure is used to correct only the parts of your tooth that are in need. This procedure is metal-free.